The quest for old game documents, particularly homemade adventure scenarios can be a frustrating search, and yield few results. We know little about how people really played, and what kind of games they did play. Things are more clear in the US – after all, many people publishing in APA zines went on to publish their stuff professionally or at least semi-professionally – while fewer things are known about the British gaming scene. One of the more famous dungeons from the age was Don Turnbull’s Greenlands, and a snippet, The Hall of Mystery, was published in The Dragon #21, showing a very tough sub-level (another, Lair of the Demon Queen, apparently appeared in White Dwarf #7). Sadly, Greenlands appears to be lost in spite of Chris Turnbull’s efforts to recover it. 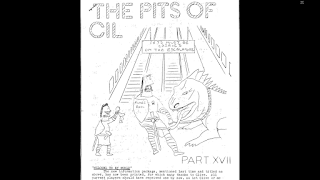 However, other traces of early D&D survive in the online repository of the UK Diplomacy Zine Archive. I discovered these artefacts while following the links from Zhu Bajiee’s post on The Realm of Zhu, which lead me to the early issues of Chimaera, a zine dedicated to Diplomacy and other postal games. Chimaera was edited by Clive F. Booth, and published a respectable 102 issues between June 1975 and July 1983. This was a time, before computer games or ubiquitous television programming, when postal games were at their peak. 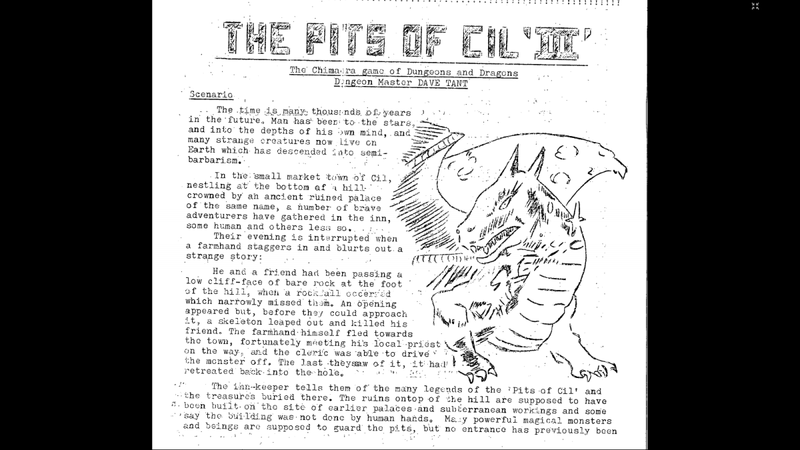 Chimaera is mostly a relic of this hobby, of which I know very little, but it also reveals a small treasure cache of old D&D content from the dawn of the hobby. 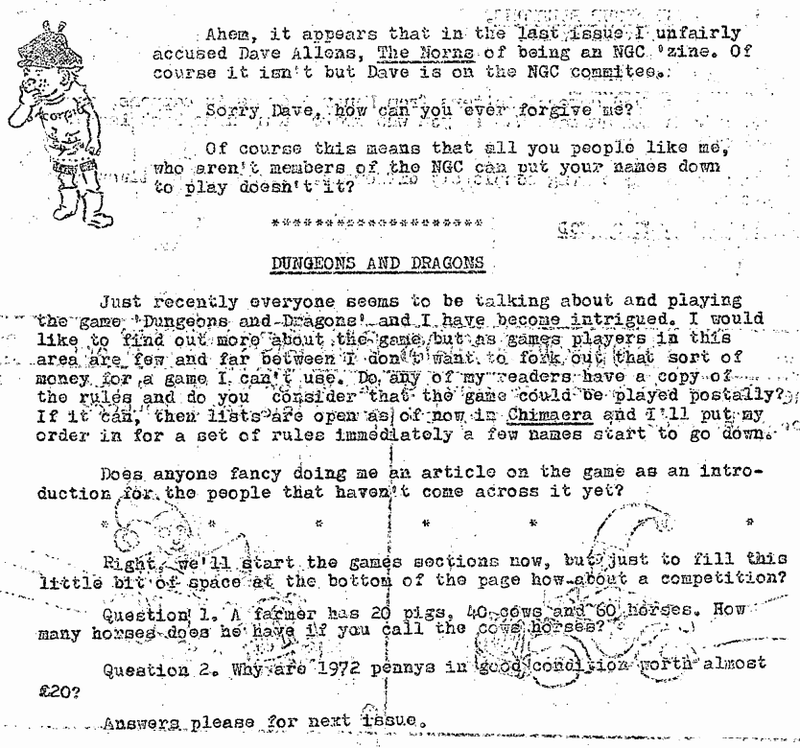 The first mention of D&D appears in Chimaera #5 (September 1975), as a request for information and reviews. This seems to be the earliest period of gaming in the UK, as people are regularly referred to three sources to obtain a copy of D&D (one of them the early Games Workshop, another based in Basel, Switzerland!) 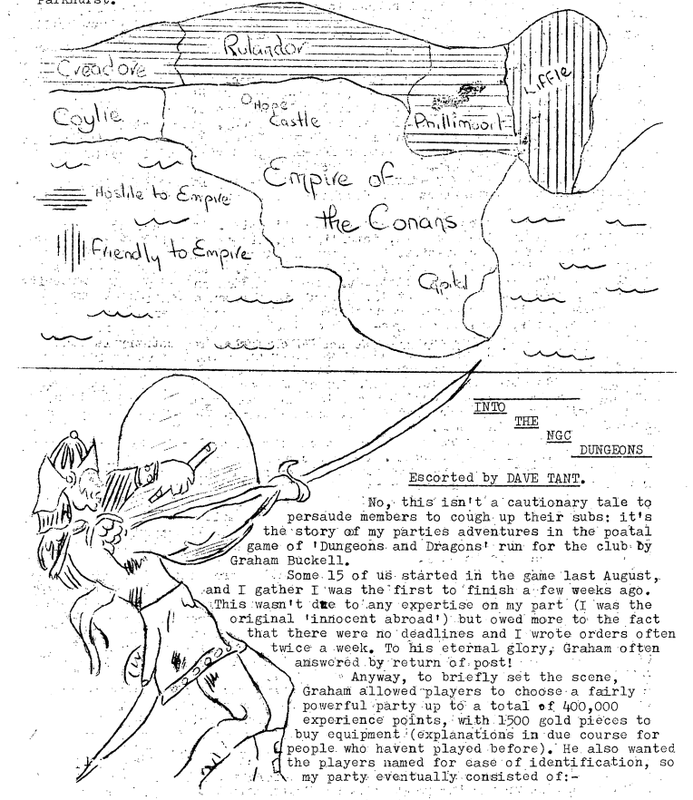 An introduction to Empire of the Petal Throne and the world of Tékumel is published in Issue #11 (January 1976), followed by a long series of adventure reports about the original migrant worker RPG (there is some quality dungeoneering there, rather less dodgy than the D&D content). EPT, in a quite naïve way, is even described as “surely the most detailed fantasy game that will ever be produced” (p. 12). Also included from Issue #19 are some play-by-mail En Garde reports with character names along the lines of Fabian Titanique, André D’Avidson (played by... yes, one Andy Davidson), Noah Speke De Inglisch, Charles Hercule de Thingy, The Scarlet Pimp, and Robert de Paté de Fois Gras – and, silliness aside, it proved very popular, becoming a regular feature through the zine’s run. However, our concern is not EPT or En Garde, but the utterly charming and fully authentic early D&D content starting with Issue #18. The level serves as a distribution nexus to reach the lower levels. There are no less than six connections in a relatively small place: two stairways to level 2, a slanting passage and a sliding door to level 3, a “space room” (whatever that means) dropping to level 5, and a trap door with a drop to level 7! That’s some serious connectivity – if you can survive the fall to those deep levels. Four monster lairs offering very different challenge levels: a smaller and larger goblin lair, a minotaur, and an orc outpost. The treasures are generous (there is a ring of three wishes), but assuming a large first-level company, several adventurers will have to die to obtain them. There are some quite magical and imaginative traps and tricks: the shrinking room, the acid fountain, an endless corridor, and a wizard masquerading as an old man, teaching the players to be wary of first appearances. 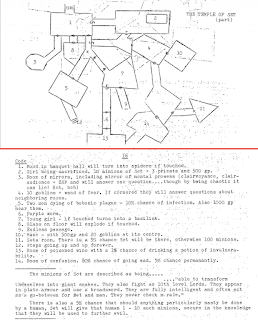 Then there is the bucket encounter (#10, forgotten from the map), which is perhaps the funniest part, and best classified as an enigma. That’s a handful – and it is all on a single typewritten page. There is a pleasing complexity to it despite the limited space: it looks like a dungeon with a decent variety of content, and a promising layout. Paul’s introduction continues in Issue #19 with an examination of wilderness play – a particularly rare thing in a dungeon-oriented period. This is one and a half pages including two maps, but presents an appealing and adventure-friendly mini-setting. It is a fantasy mishmash where elves live in the forests, dragons live in the mountains and hill giants live in the hills, yet it has its own peculiar feel. The area surrounding Hope Castle is ruled by a disintegrating Empire ruled by the insane and childless Emperor Orweelia VI, and managed by a cadre of incompetent bureaucrats and a host of greedy local nobles. There are decent bits like “[on] the road through the vampire caves to Red Castle, there are two huge statues blocking the roads. It is said that anyone passing under them rather than around them, will be cursed with bad luck and die or else become incredibly rich – all within a year”, or a quarantined city with raging bubonic plague. Issue #25 offers further detail on the empire’s most important nobles, from the ancient wizard to the knight who turns men into mutants and sets them loose in his dungeons... and Grimy of Groin, a PC dwarf who obtained a castle by poisoning its former inhabitant (kind of a pattern in Paul’s games). Merlin: often adventures alone or in a company of orcs, “was once friendly with a Balrog, but did nothing to prevent the Evil High Priest from charming the arse of it”, GM finally got rid of him with a potion of poison. Sinbad, Son of Popeye, Son of Trufo: “Takes great masochistic pleasure in getting killed, to the point where he attempted to wipe out 16 werewolves on his own!” He was backstabbed and killed by Merlin and Aragorn. John of Redtown: a rare lawful cleric, fond of using flaming oil-based tactics, and reliant on friends to keep him alive. Was once turned into a swine by a beautiful witch. Lefalia the Elf: flaming sword guy. The map is a branching structure with a prominent use of secret doors. The players could miss much of the place if they were careless. There are no connections to other levels (what appear to be stairs are just a trick), probably meaning these complexes were located on the boundaries of a regular level. The key is a mixture of general and themed encounters. They have a sinister bent, like a girl being sacrificed in an evil ritual, men dying of the bubonic plague, food being poisonous or turning into spiders, or exploding glass. They also appear dangerous, potentially deadly for an unwary group. There is a room where there is a 5% chance you will meet Set; otherwise, you meet 100 of his minions (10th level Lords). Seker’s temple is of course much less interesting than Set's, but it could potentially serve as a base of operations for Lawful groups (although considering Merlin and Aragorn, they would just loot it and put the inhabitants to the sword). There is a room of 3 wishes, and another where there is a 1% chance of an encounter with Seker (as the key informs us, lawful gods are more busy than chaotics). Paul Cook’s campaign was not the only one to receive attention in Chimaera. 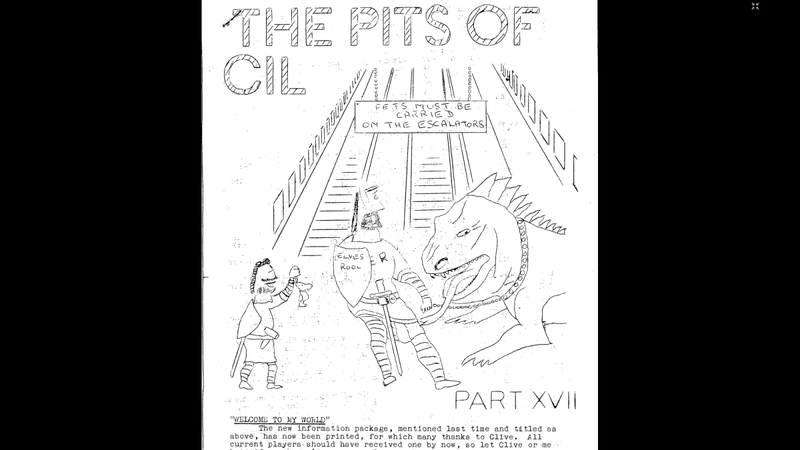 Dave Tant, whose articles start from Issue #19, focused on higher-level play, and organised a zine-spanning play-by-mail campaign called The Pits of Cil. After organisational matters and rules interpretations, the campaign is introduced for good in Issue #22. It is a post-apocalyptic setting of a future Earth descended into barbarism and populated by strange new creatures, giving a grounding for the dungeon, “an ancient ruined palace”, “built on the site of earlier palaces and subterranean workings” (in fact, the name comes from Eyes of the Overworld, although it does not seem to have provided more than some superficial influence). Tant’s game involved eleven parallel groups delving into the ruins, from The Hill Booth Boys to Leviathan’s Angels. All of them were assembled from a generous XP budget, allowing for a mixture of high (7th-8th) and low-level characters plus retainers. Issue #23 introduces a further opportunity for coop play in the form of Inter-Zine Dungeons, allowing the transfer of characters from one zine’s campaign to another – “forcible (i.e. involuntary) transfer by means of a transporter room”, “voluntary transfer by means of a trek across a moderately hostile landscape”, or transfer via a wish. It is raised that this presents issues of rules compatibility and referee interpretations (concerns which influenced the design goals and tenor of AD&D), as well as different paces of publication between the zines. The idea of a multiverse of games – whose US parallels are recounted in a classic 2005 thread by Calithena, and which has been revived via the much more recent Constantcon and the FLAILSNAILS conventions – seemed to hover between something that was at once very desirable, yet laden with conflicts and trouble that made implementation mostly impractical. The postal format itself posed problems: later issues reveal players regularly missed turns, or did not respond accurately to prodding, resulting in outcomes like “Still nothing heard from Les Kennedy, so his character dies, and his party turns chaotic. Sorry to see you go Les.” (As it turns out, these followers turned into roving, autonomous mobs of chaotic rabble who posed a danger to the active players.) Exploration seemed to proceed at a very slow pace, although the PVP infighting – a popular and exhilarating hobby on MUDs and later online games – must have made up for it. The early write-ups don’t reveal too much about the Pits of Cil beyond the creative chaos taking place, but some play reports do exist. In Issue #34, Tant gives a DM’s perspective of a convention session, which may have taken place in The Pits or (more likely) could have been entirely self-standing. 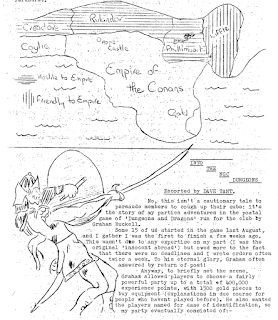 The quest for The Bowl of Midas has ideas like a rack of electrified swords (ouch), and “the Stone Giant, heavily disguised as a Giant Beatle with a Magic Guitar.” From Issue #35, regular and more detailed play reports start appearing (this was around the time the first character reached the 5th dungeon level). 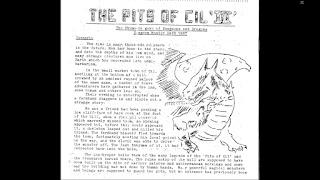 The Pits of Cil continued for four years, spanning over 850 letters before it wrapped up in Issue #69 (October 1980). Dave Tant already drew some conclusions in Issue #62. The dungeon was starting to get clogged with “abandoned parties”, and the remaining players – down to ten after the campaign’s heyday of thirty or forty, this final number including Don Turnbull – had to spend most of their time repulsing their attacks. Runaway PVP also hindered dungeon exploration, and the faster correspondents could gain an advantage above their peers. The campaign ended with a bang, with an earthquake destroying the dungeon and the remaining characters using their wish spells to escape (one particular player from his wedding to a fairy princess). 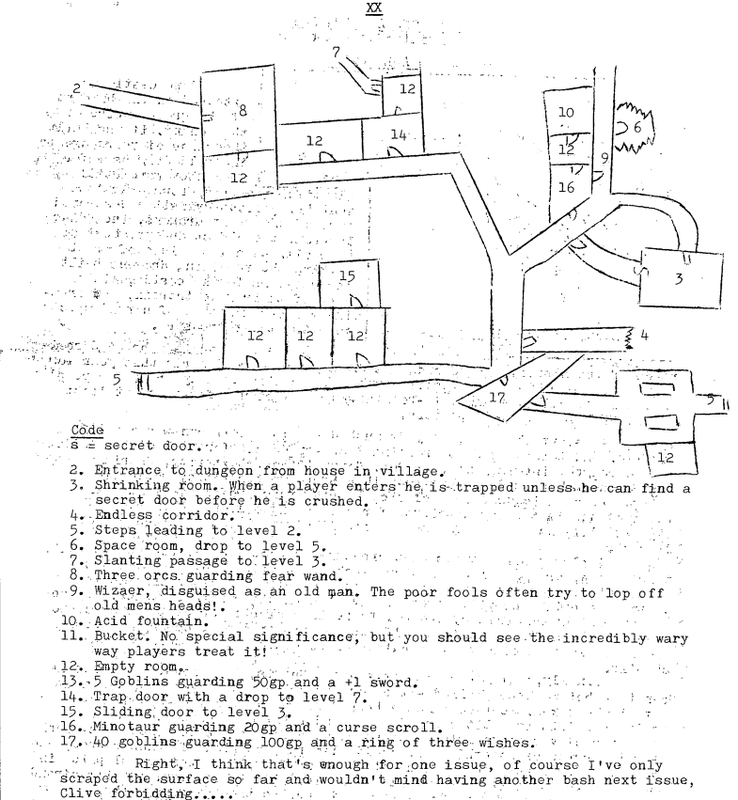 Tant planned a followup AD&D campaign set on an island, but details of this game are scant. Chimaera itself lasted until July 1983, ending its run with Issue #102 after eight years, something that’d make many commercial hobby publications proud. As editor Clive Booth noted, the drive was no longer there, nor were many of the friends he had started the journey with. 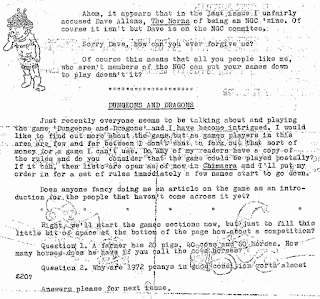 There were, of course, changes in the world as well: later issues talk increasingly about microcomputers, while D&D had gone from its roots to something rather different. It was, without doubt, the end of an era. Good find! In Hip Hop, the equivalent of what you did counts as Crate Digging, to find obscure Beats & Breaks. I like it. I do not like PvP, though and the British GrimDark seems strong in these finds. Do we know more about more upbeat examples from elsewhere? I am curious as to your opinion on the sparsity of these bare bones, one-page-dungeons. Also: I cannot find the original "Tyranny of Fun" essay anymore. I understand you got so much flak for it, you changed it? My memory is a bit hazy on that protracted flamewar, with it's mutliple incarnations. I think it is an enormously influential plea for the DIY-spirit in the 21st century, and I would argue it indeed changes some minds. So I'd like to reread the original, 2006 EN-World version but cannot seem to find it. These relics (and that's what they are) are not one-page dungeons in the modern sense. They are obviously extracted pieces of a greater whole, offered as examples of what D&D can do. The main problem I see with one-page dungeons is their self-limiting nature. These pieces aren't self-limiting, but expansive. The intro level has obvious departure points hinting at a complex dungeon behind them (you can travel to four different levels from such a small place). The competing temples are sub-levels hidden in the fabric of the larger dungeon, implying the existence of an expansive, complex labyrinth where they must be found. These notions point outwards, beyond the scope and confines of the sparse writing. They invite you to think big. 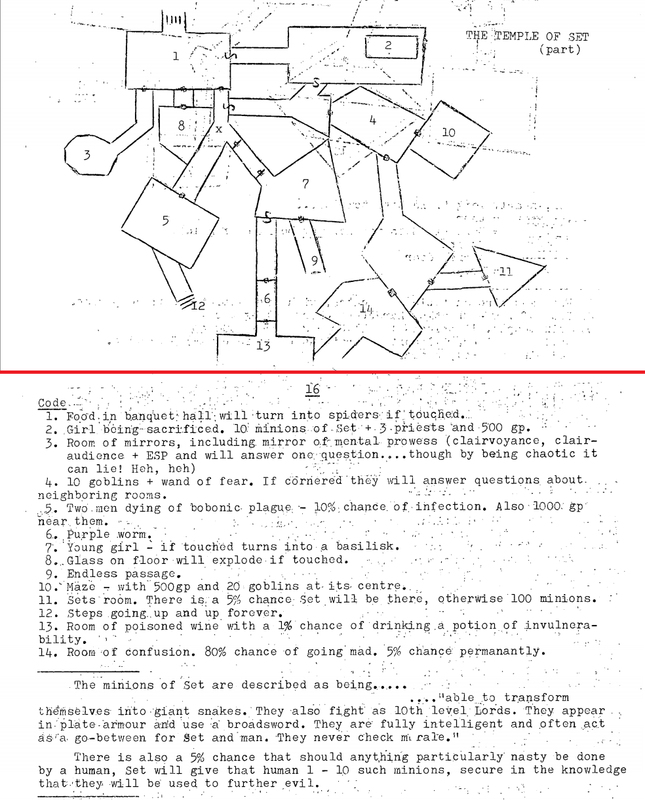 Thus, they are the exact opposite of the one-page dungeon - they are samples of large, complex campaign environments. Now the writing of the encounters, that's too little for me. I want more description and slightly more internal consistency (without turning the dungeon into a bland ecology experiment). 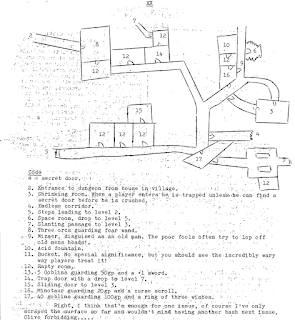 They are examples of the-dungeon-as-puzzle idea of early OD&D (arguably challenged for the first time by Arneson's Temple of the Frog, then Judges Guild's City State). I appreciate it, see the appeal of it, find a lot that is admirable and inspiring in it - but do not practice it in this form. However, the way it encourages you to grow your campaign beyond that entrance level - and take it out of the dungeon to the Empire - and let your players run wild with it until you have "Ffahrd" and "Merlin" running around the game... that's still magical. WRT The Tyranny of Fun posts, the only place they exist now is in copies (mostly made by people who hated the idea). I got so weary of the crap I got for them, and the way this hounded my online reputation, that I went back and deleted them. It was a bad idea because it didn't stop anyone from attacking me (an important lesson - never bargain with idiots), while I went back on an idea I that's probably even more relevant now than ten years ago, but there you have it. It is gone. That's well made. I have a tendency to have players contemplate and wonder at the environments I create without designing buttons to push and levers to pull because I don't like obvious gaming trappings. But as you say it is a means to pull them in. Yes, I am a very sympathetic DM particularly in life and death situations. Those stage improvising comics have a rule about always accepting what the other has just said never denying it - and that is a rule designed to maintain flow. That's interesting. I used to interpret the saving throw against falling *failure* as sometimes meaning the character did not actually fall. You have to really because the falling damage rules don't make sense when HPs mostly represent luck. There is something wrong if a DM can't make an orc fascinating if you think about it even to veteran players. The responsibility is on the DM to express himself with invention but also on the player not to react with 'o, he means an orc. I know the stats for that'. Players have to buy into the environment and out of the 'game'. Edit: ""Aragorn" and "Merlin"", not ""Ffahrd" and "Merlin""
Melan that was fascinating. Thanks so much for writing that up. Paul Cooks work sounded particularly great and it makes me wonder if he is still out there somewhere and might have more to share. It would be great to recover and preserve/publish some of these treasures while they are still out there. (The fate of Don Turnbull's Greenlands is a big cautionary note.) Underport: Abyssal Descent, Rappan Athuk or what we have seen of Stefan Poag's Mines of Khunmar show how different these personal projects tend to be. Is there a reason for posting the same comment three times? I can't offer any comment but my general agreement.